Here you will find some common questions I get asked frequently. My home studio is based in the beautiful location of Bournemouth, Dorset. This is within easy access from areas such as Poole, Ferndown and Hampshire. How long does the newborn photo shoot take? The photoshoot can last anytime between 2-4 hours, an average session is three hours long. This is a time where you can sit back, relax and enjoy the experience. I provide snacks and refreshments however I always advise clients to bring some lunch, especially if mum is breast feeding. My sessions are relaxed, fun and informal and most importantly never rushed. This allows lots of time for baby to be fed and changed during the session. I never schedule more than one newborn shoot in a day, this way I can ensure that your shoot is not rushed and I have time to create beautiful images for you. Baby safety is paramount during my sessions, I always ask parents or family members to help at times to be a 'spotter' to ensure your baby is safe at all times. Why do I have to contact and book my session so early? It is important to book in with me as soon as possible after your 20 week scan. Availability gets booked up very quickly, by booking and paying your booking fee you will have peace of mind that your session is booked. I am then able to block out in my diary a two week time frame around your due date for the shoot. Babies rarely arrive on their due date but this is a good estimation for us. If you are booked in for a C-Section we can book a date straight in. Once you have had your baby it is also really important to let me know as soon as possible so we can schedule a day and time for the shoot. 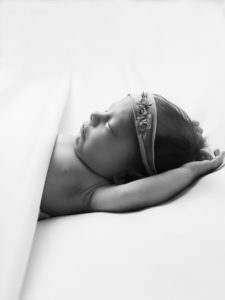 What is the best age to photograph my newborn baby? Newborn babies are best photographed when they are aged between 4-14 days old. This is the time when they are the most sleepy, flexible and I am able to pose them in various ways. You are also able to capture and treasure beautiful images of your baby when they are at their smallest. Anytime after this these poses can be more difficult to achieve because babies are less supple and more alert. However if are you are late booking please do still get in touch, we can still capture beautiful shots of your baby. How much does a newborn photoshoot cost? Please see the investment tab in the menu for starting prices and booking fee information. Please email me for a full price list of products. Can I bring my friends and family to the photoshoot? I would advise bringing one other person with you to the shoot. The space in the studio is limited to an extent and I like to keep distractions and noise to a minimum. If you would like sibling shots children are welcome however it is sometimes a good idea to bring them at the end of the shoot. When will I receive my edited images? After the photoshoot we will arrange a day and time for you to come in to your ordering and viewing appointment to view your full gallery of images. This will be approx. one week after the photoshoot. You will then be able to view sample products such as beautiful Italian albums, wall art and canvases. It is always a good idea before coming to the viewing session to take a minute to look round your home for wall space to see where you would like to hang your images. I would advise wearing something light in colour, whites and greys work really well in the studio. However you are welcome to wear anything that you feel comfortable in.